What happens when the public takes a tweet out of context and begins a crowdsourced effort to unseat a late-night television host from his throne? 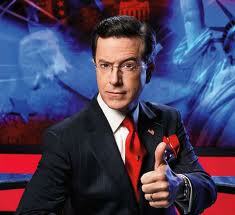 The answer: #CancelColbert. Although the comment itself was in fact making fun of Washington Redskins owner Dan Snyder some reacted in a rage, calling for the cancellation of the popular late-night program. The most vocal advocate was Suey Park who formerly organized and popularized the #NotYourAsianSidekick social campaign. The hashtag trended for a few hours and sparked a debate between those seeing the tweet as racist, and Colbert loyalists who pointed out the tweet was taken well out of context. Regardless of which side your on the power of social media was full force last night. And once again, it showed us that when everyone talks nobody listens. This entry was posted in Industry News, Television Programming and tagged CancelColbert, Colbert, Comedy Central, social, social tv, Stephen Colbert, tv, tweet, twitter by Yoni. Bookmark the permalink.